So, over the river, goodbye to Thailand and hello to Laos a new country to both of us and the 8th of the trip so far. Once we were over the bridge, we came to a strange crossroad and traffic light set up, allowing vehicles to swap sides of the road – they drive on the right here. At the immigration building, we filled out our forms, payed $35 US each and after waiting 10 minutes, had our 30 day visa and entry stamp. 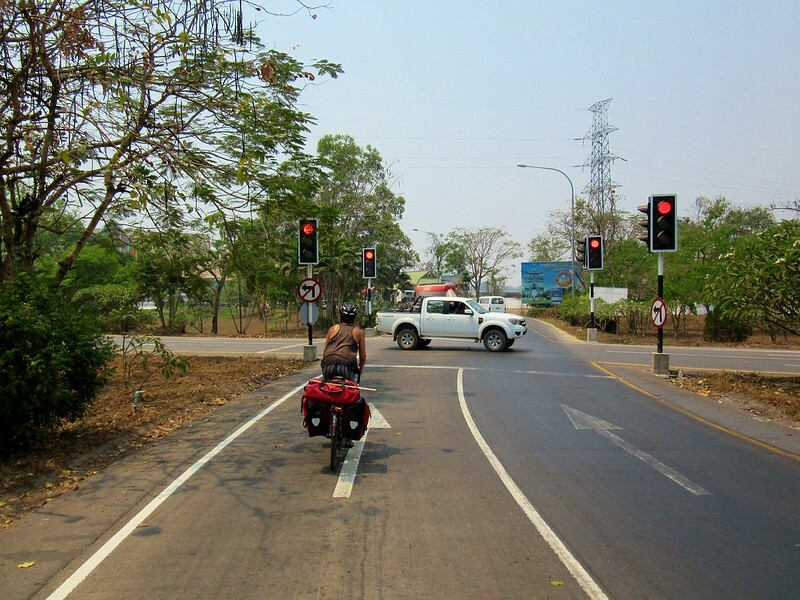 Now we just had to backtrack along the north bank of the Mekong for 20km to get us into the capital city, Vientiane. We’ve ridden into a few capital cities now, Tokyo, Bangkok, Seoul, plus numerous other large cities in China, and it rarely makes for the most relaxing cycling. 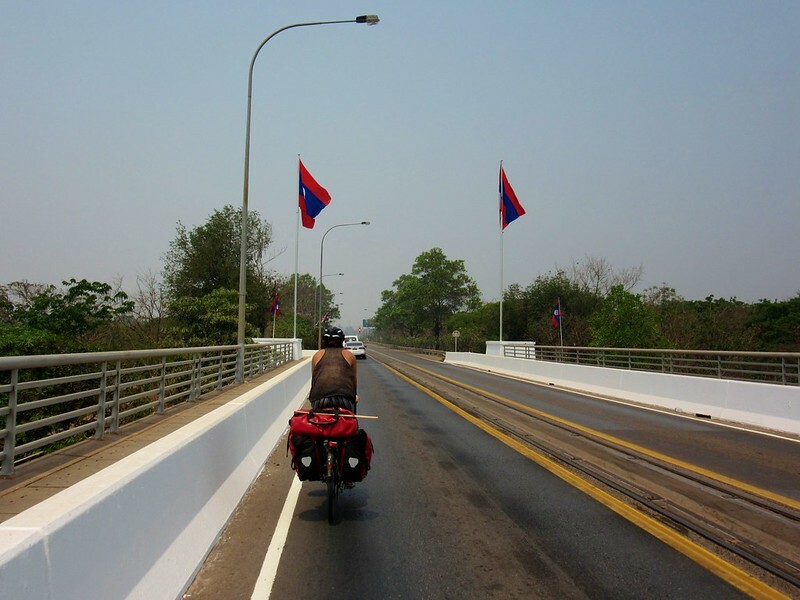 But cruising into Vientiane was a breeze. It’s very small as cities go, and the traffic in the afternoon was very mellow. Finding our accommodation in the centre was easy, and before we knew it we had ditched our bikes and were sitting with a cold Beer Lao in the courtyard bar. 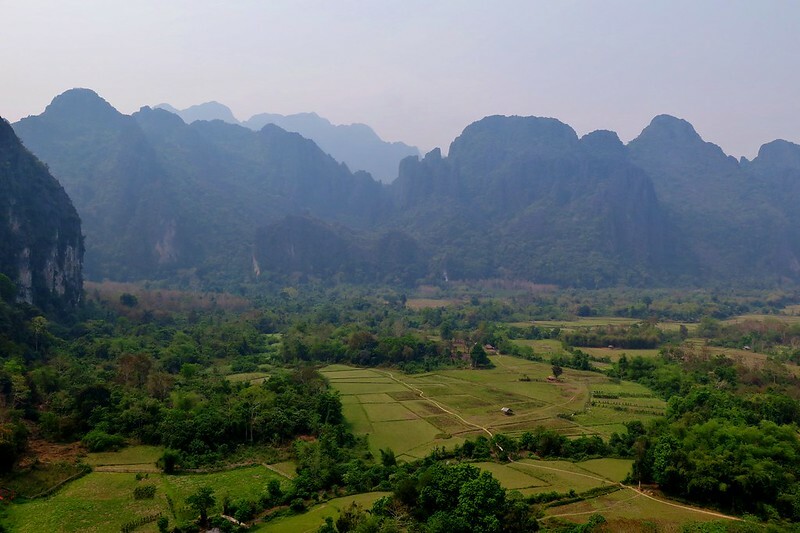 We were definitely back on the backpacker trail here, although it seems like Vientiane is just a stopping off point for people heading north to Vang Vieng and Luang Prabang. There is also a big expat population, with embassy and NGO workers based here. It meant we had plenty to choose from when it came to Foreign Food Friday which, conveniently, coincided with our 2 days in town! Moules frites at a Belgian restaurant was our choice this week. Although we mayyyy have gone on a little tour of Europe during our stay, taking in a bit of French and Italian cuisine while it was available. 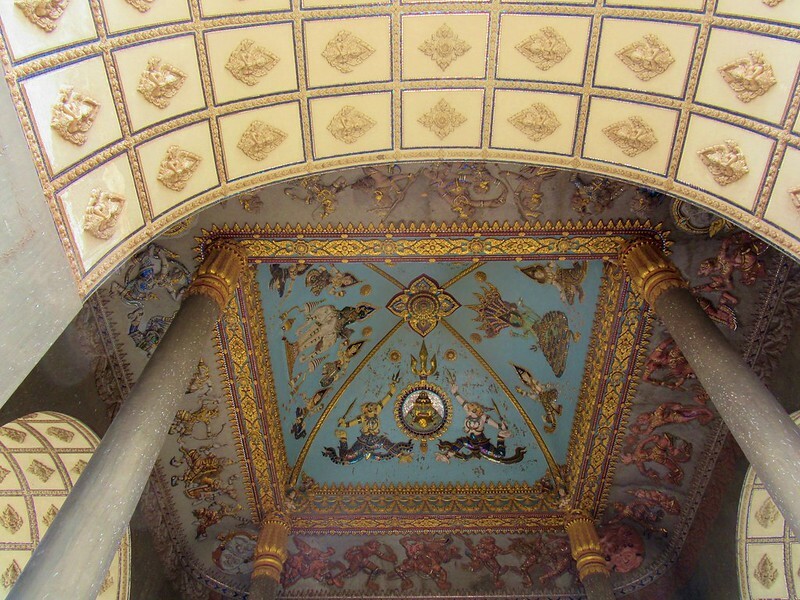 We walked around the centre, looking at a few of the places of interest. Lot’s of temples (Wat!) 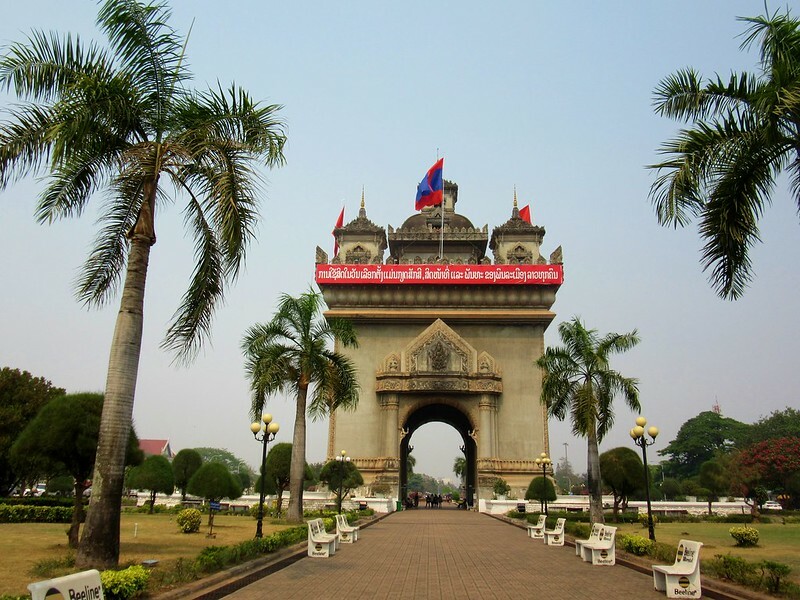 and the famous Patuxay monument, Laos’ version of the Arc de Triomphe – build with concrete donated by the Americans intended for a new runway at the airport. 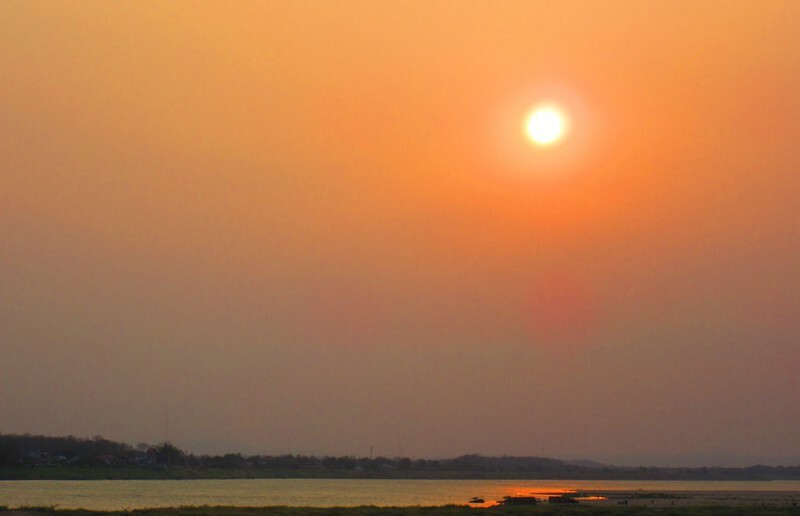 In the early evenings we went down to the walkway next to the river to watch the sunset. There’s a big market there and the locals were out shopping, eating, walking and some even doing aerobics in big groups to pumping music. Finding our route out of the city was just as easy as coming in. We set off from our hotel, turned onto the main road, Route 13, and that’s it. 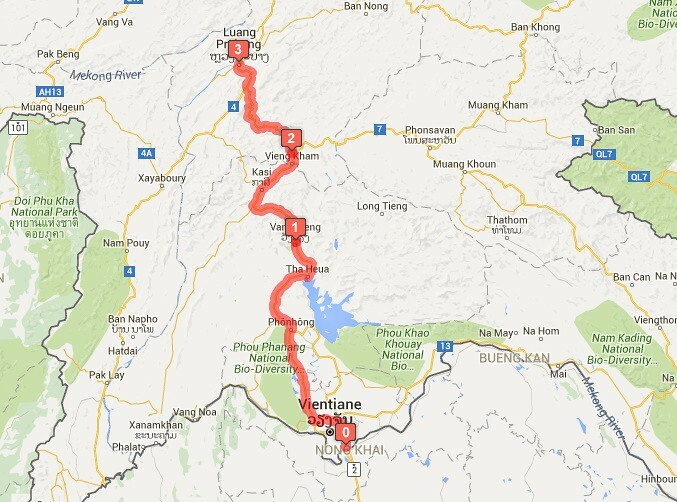 That’s the road we’ll be following all the way through the country to the China border, about 700km away. The weather was overcast and significantly cooler than it has been up until now so the riding was comfortable. The road surface wasn’t great though, the first 20km had a lot of unfinished sections and we were dodging a lot of large potholes. This will be a theme in Laos, it turns out. The road surface generally is pretty good, certainly much improved over the past few years, but there are a lot of potholes and sudden patches of gravel which can catch you out if you’re looking around or riding downhill fast. We stopped after 50km for a drink. The further we were getting from the city, the more kids we saw beside the road waving and shouting ‘sabaidee’, hello. The adults are a lot more stand offish than in Thailand, we only get an occasional smile or sabaidee, but the kids are amazing! They’ll run out from inside their houses in groups, waving, smiling and shouting at us. Some want high fives, some giggle and some run along beside us if we’re riding slow enough. Definitely a morale booster when we’re riding up steep hills. But we’ll get to the hills later. Our first couple of days were fairly flat. 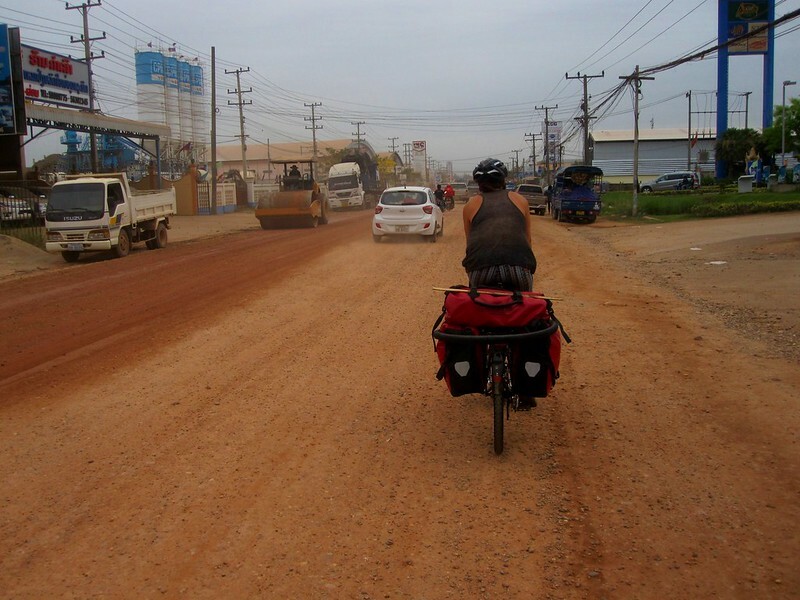 Our first stop was at Phonhong, a dusty strip town 70km from Vientiane. 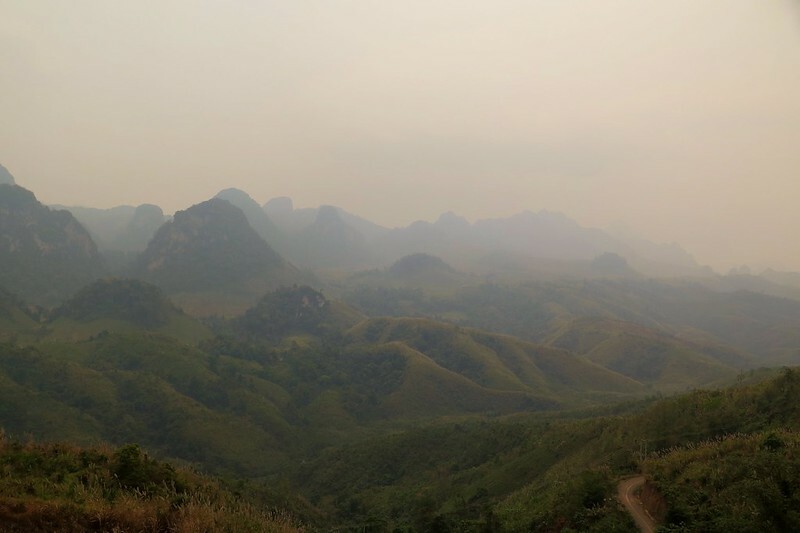 The second day we rode 82km up a couple of easy climbs and into some more undulating terrain to get us to Vang Vieng. The scenery around us started to get really good halfway through day two. 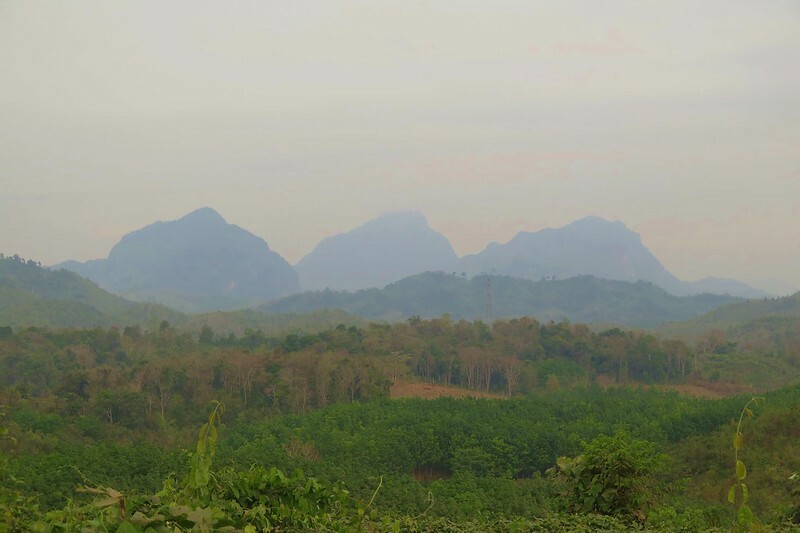 In the distance we began to see the towering limestone karsts that the area around Vang Vieng is so famous for. We were really enjoying ourselves. 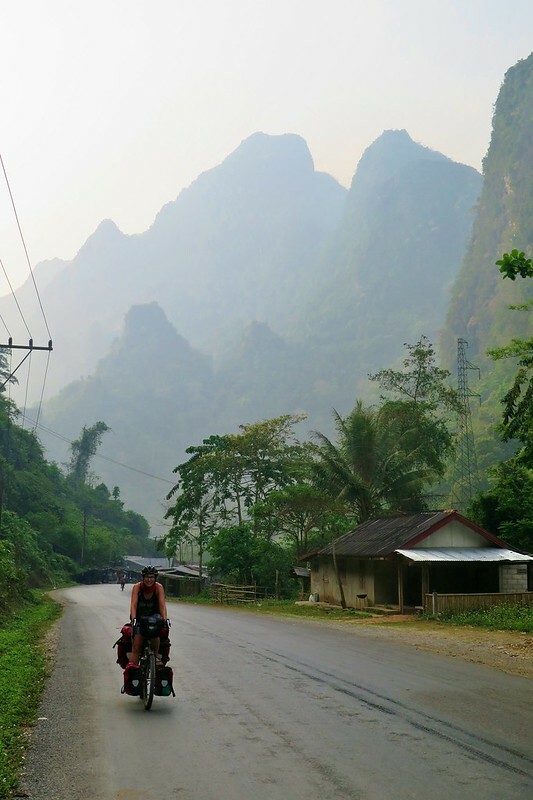 A little outside of Vang Vieng, we met another cyclist, Koen from Holland on a Santos touring bike. 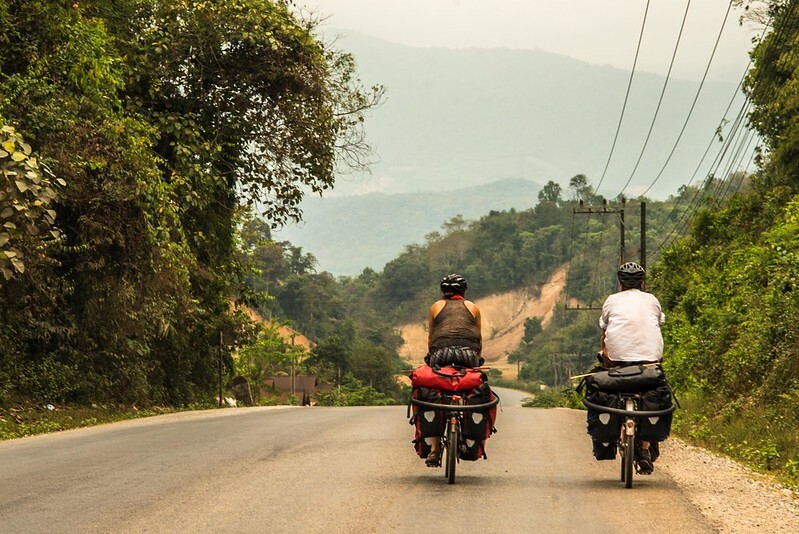 He’s been riding through SE Asia, starting from down in Malaysia, and was meeting his parents in Vang Vieng. We rode together chatting for the rest of the way. He also very kindly took one of the only (maybe the only?) photos we have of us both riding together, so thanks for that Koen! Just before arriving, we passed 8,000km, or 5,000 miles on the speedo. Cue the traditional photo and high five. 5,000 miles sounds like quite a long way, and we’re definitely now starting to feel like we’re on a long tour, especially when we look at the distance in a straight line on a map. 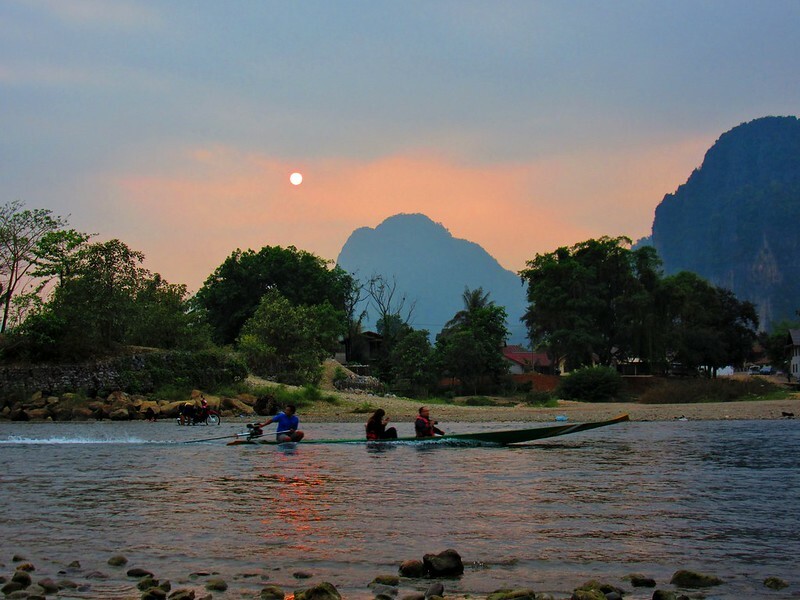 Vang Vieng is the hedonistic backpackers’ mecca, known for drink, drugs, river tubing and bars showing Friends on repeat, all day, every day. Or, at least, it was. After dozens of deaths every year from the un-regulated tubing, the government decided to act and shut the whole thing down. There are still a few tubers, and a few bars serving buckets next to the river, but we were surprised at how quiet it was. There are a lot of Chinese and Korean tourists, and a lot of people doing the kayaking/cycling/trekking ‘eco-tour’ thing. The surrounding area is unbelievably beautiful. We stayed two nights, so had a day off to explore. 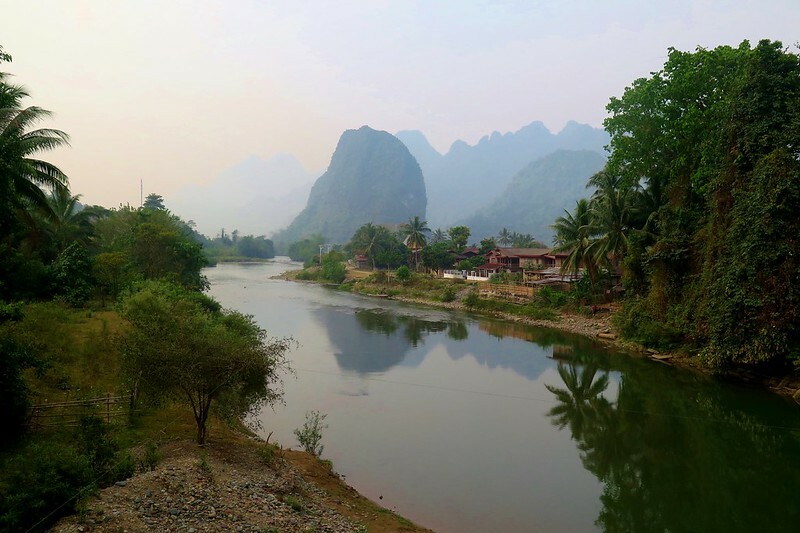 We walked next to the river, over the wooden bridge and into the fields opposite Vang Vieng, surrounded by vertical cliffs. 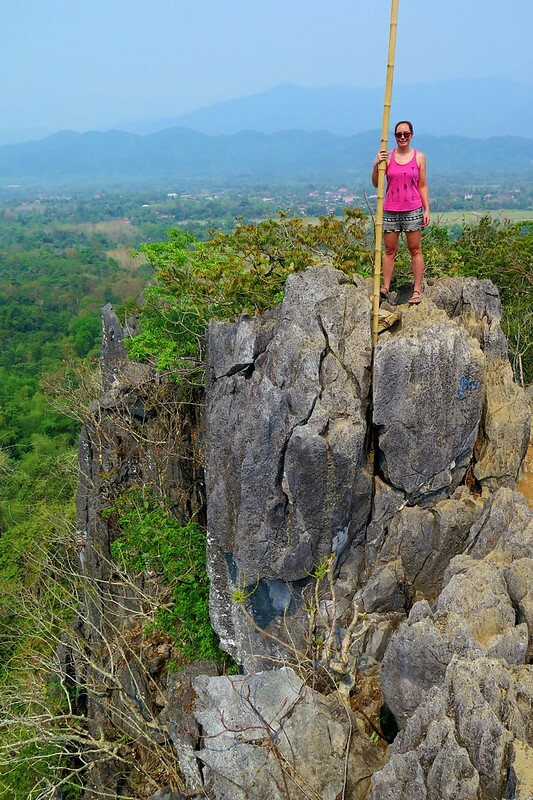 We climbed one of the smaller rocky outcrops, giving us a good view back at the town. The path was steep, over boulders and up old ladders strapped to the rock getting us to the viewpoint on a knife edge. Not a good one for someone with vertigo. We went into one of the caves in the cliffs too, giving us some nice shade from the sun. At times, there are pools inside the caves that you can swim in, but we’re in dry season, so we missed out. We’d hoped to meet up with Koen for a beer, but he was busy with his parents, but I’m sure we’ll see each other on the road out to Luang Prabang. 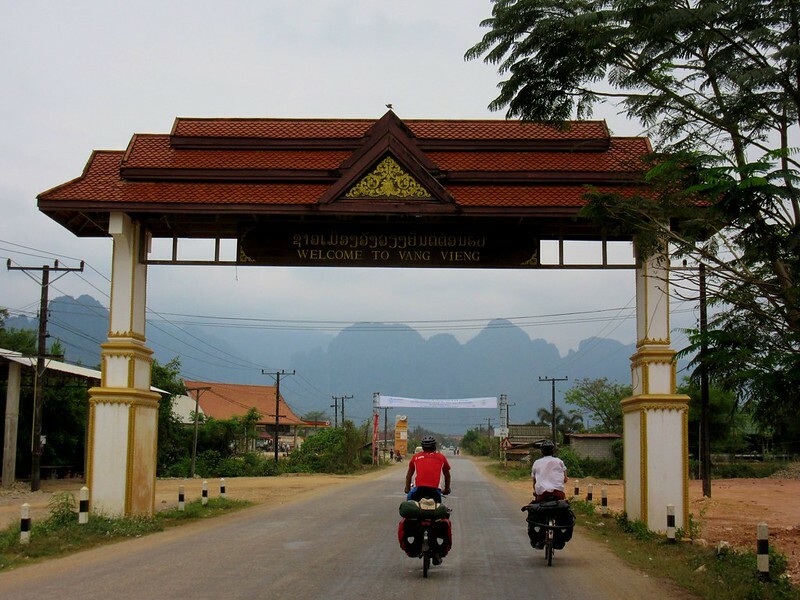 The next part of the route, from Vang Vieng to Luang Prabang is very popular with cyclists, and a stretch that we’d been looking forward to and nervous about in equal measure. Excited for the views and amazing scenery through the mountains, but fearful of the long, steep climbs that we’d heard and read about. We left early, as the sun was rising, to continue north on Route 13. Above us were hot air balloons, no doubt getting a spectacular view of the area at sunrise. 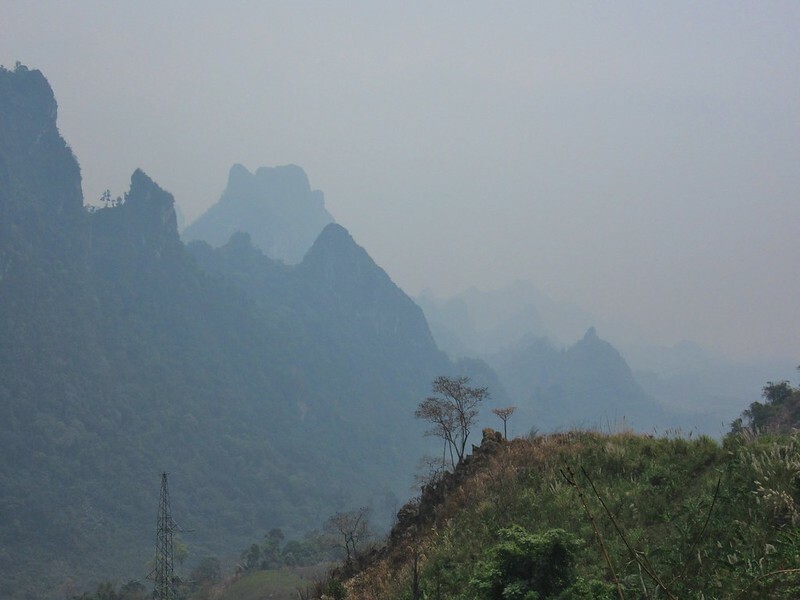 The first 20 kilometers followed the river valley, with cliffs on both sides of us. Despite being the main route through the country, the road was really quiet. We were able to cycle side by side and chat, being careful to dodge the odd cow or chicken which we saw more frequently than other cars. The valley then narrowed and the road passed through a tight gorge and started to climb. At points, it was steep, but on the whole it was quite a gradual up. In low gears, we worked our way up, stopping occasionally for water or photos. Reaching a high point on a ridge, we then were straight into a decent, about 8km of consistent downhill into the next valley and the town of Kasi where we stopped for some lunch and to replenish our water bottles. The valley around Kasi was flat for a while, we continued north through fields of cabbages, surrounded by little white butterflies. We were hoping to find and stay at a little hot spring with a few bungalows which we’d read about in countless cycling journals. I knew that it was 21km from Kasi so we started up the next climb in the knowledge we didn’t have much further to go. This climb took us even higher than before, beside jagged cliffs and a tall rocky mountain that dominated the skyline. Unfortunately the air was very hazy, so we couldn’t see too far into the distance. The farmers burn the waste from their crops at this time of year, which means there’s a lot of smoke and smog in the air. 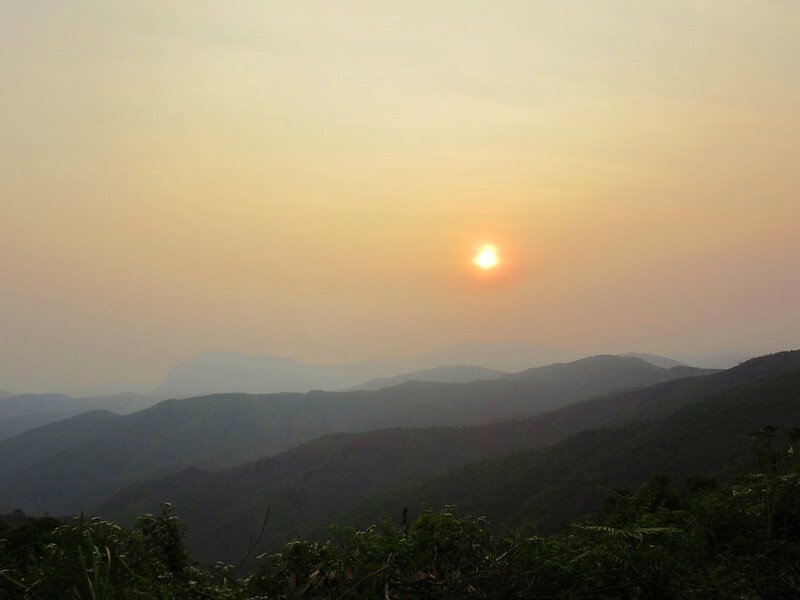 We could see the mountains near to us, but once we got higher, the ridgelines further away were just silhouettes in the haze. What we saw was amazing, but we can only imagine what it’d be like on a clear day. After 78km for the day, we saw a big sign on our left for the hot springs. 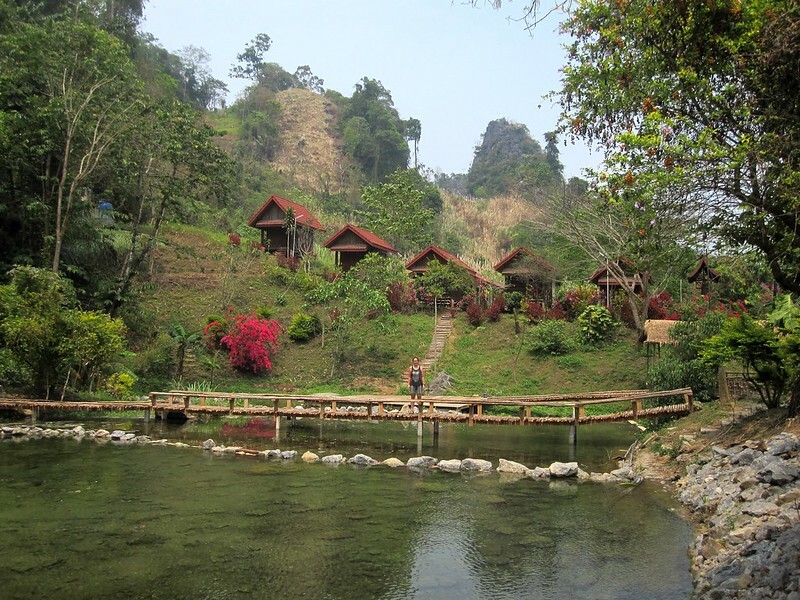 There were five bungalows tucked into the hillside, next to three hot spring pools. A woman popped out from the restaurant opposite, greeting us in near fluent English, and showed us to one of the bungalows. 80,000 kip, 7 quid, not bad. We quickly unloaded our bikes and went for a soak, which felt great on the legs after the climbing. It wasn’t quite a Japanese onsen, but a very passable imitation! As we ate dinner that evening, the woman from the restaurant gave us a bit more information about the route ahead. 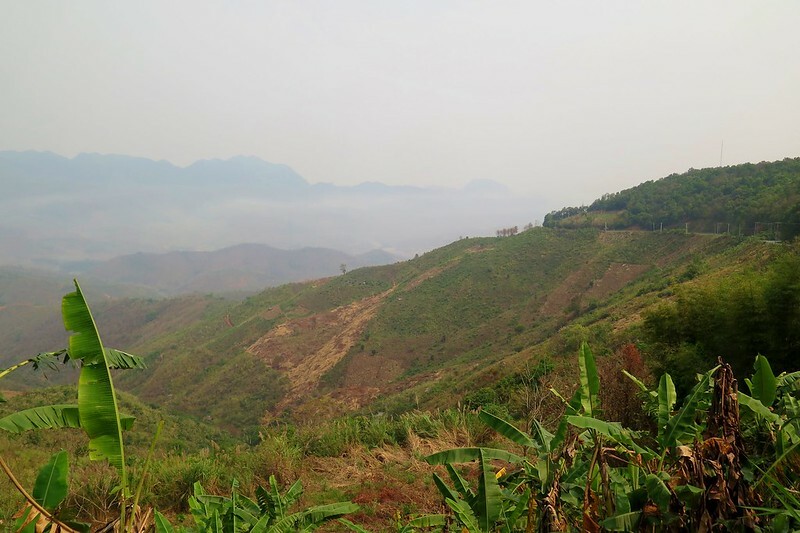 We had a quick descent, followed by 24km of solid climbing to get us up and over a pass before reaching Phoukoum. We could either stop there, or continue on for a further 50km to Kiewkacham. There wasn’t any accomodation in between. Leaving early the next day, prepared to tackle the pass, we’d more or less decided to have a shorter day and stop at Phoukoum. The initial descent was fun, as they always are, but we couldn’t help thinking that every metre we lost now, we’d be climbing again soon! Sure enough, after a couple of kilometres, we were into it. Starting from the bottom of a valley, we worked our way slowly up the mountainside. The road hugged the countours and wound its way up, meaning the gradient stayed fairly consistent. 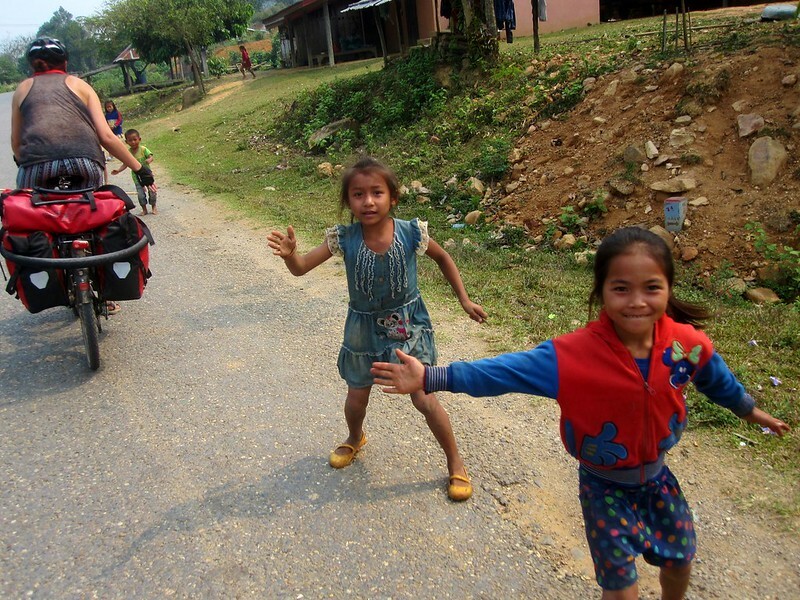 Again, there were loads of kids beside the road in the villages, cheering us on and waving to us. Slowly we got higher up onto the ridgelines at almost 1,500 metres. We reached a false summit at one point, where there was a restaurant perched on the edge of a hairpin bend. We stopped for a quick drink and saw dozens of stickers on the window from cycling and motorcycle touring companies. This really is a popular route. Another hour or so of riding up hill, and the road levelled off. 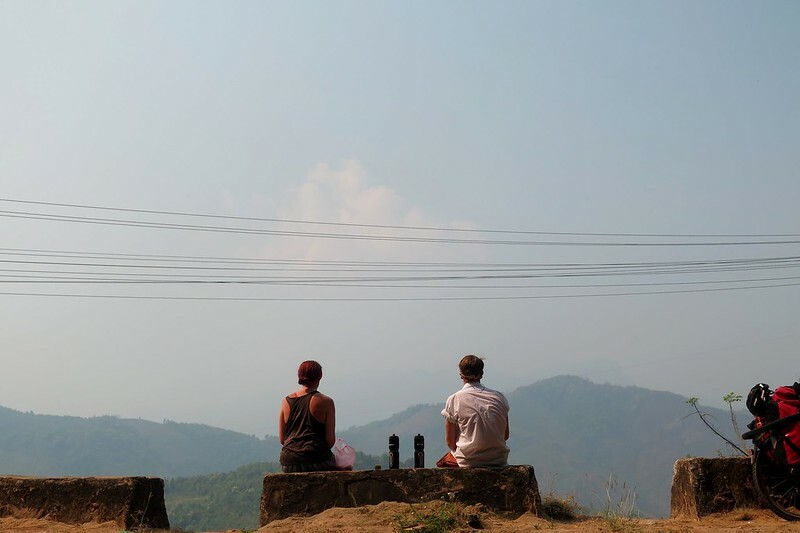 We coasted for a few minutes, rolling into Phoukoum, a tiny town built around a junction, one road heading towards the Vietnam border, the other continuing up to Luang Prabang. We had a bowl of noodles and confirmed with each other that we were happy to stop for the day and not continue another 50km. The hunt for accomodation didn’t take long, just next to us was a Chinese owned guest house with quick wifi, a clean room and a kettle! 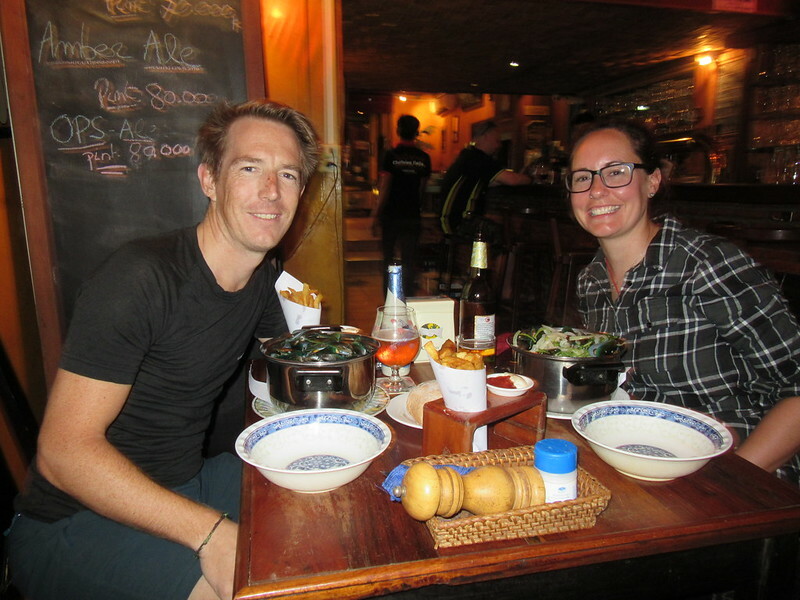 The adjoining Chinese restaurant was also pretty authentic – Clare ordered fried pork for dinner, and ended up with a big plate of greasy and fatty pigs trotters. Yum, can’t wait to get back to China! 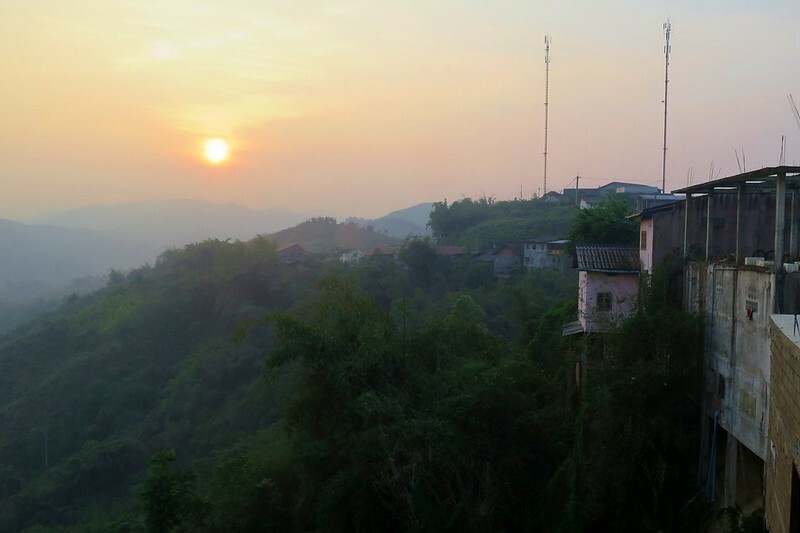 The town is perched up on top of a mountain and the buildings were hanging over a steep slope. We delayed leaving the next morning by a few minutes while we watched the sun rising from the guest house’s balcony. We started with a short climb, and then continued with more ups and downs for the first 20 km. More great views, looking out at mountains in every direction. Then the road dived down into a valley, losing a lot of the altitude we’d gained the previous day. We knew we’d be spending the rest of the day climbing back up to Kiewkacham. Again though, the gradient wasn’t too bad, so although it took us some time, the uphill was nowhere near as bad as what we had in Thailand. 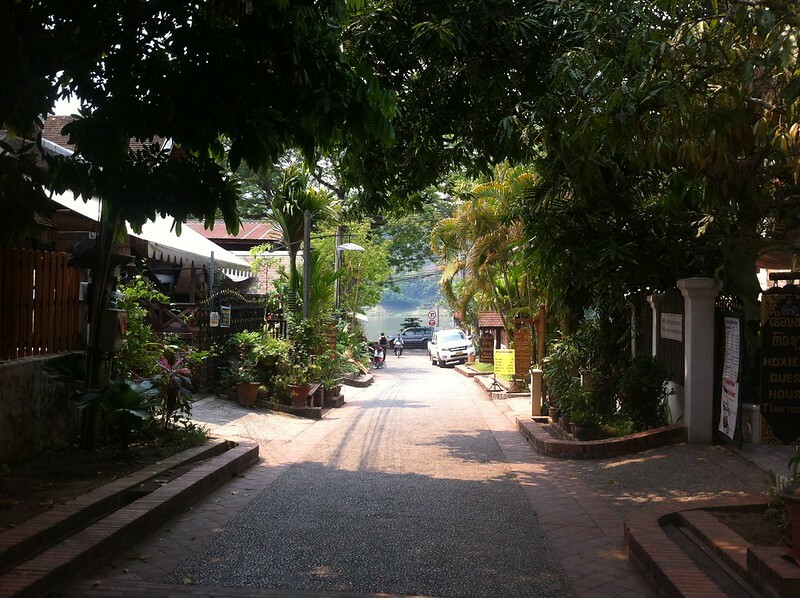 Kiewkacham is an even smaller town than Phoukoum, with a couple of shops and restaurants, and just two guesthouses. We took the last en suite room in town when we arrived in the early afternoon. Later on, we were chilling in our room and heard a very unfamiliar sound from outside. It sounded almost as if water was falling out of the sky? We haven’t had any rainfall at all in South East Asia, so it was a surprise to see a big thunderstorm and pouring rain. When we went to get some dinner, we spotted a soaking wet touring cyclist who’d just arrived. It was Koen, the Dutch guy we met on the way to Vang Vieng. He’d left VV a day after us, but done the whole leg from the hot springs to Kiewkachan in one day. He looked knackered, making us very pleased with our decision to take it easy. He joined us for dinner and a well deserved Beer Lao after he’d found a room and dried off. 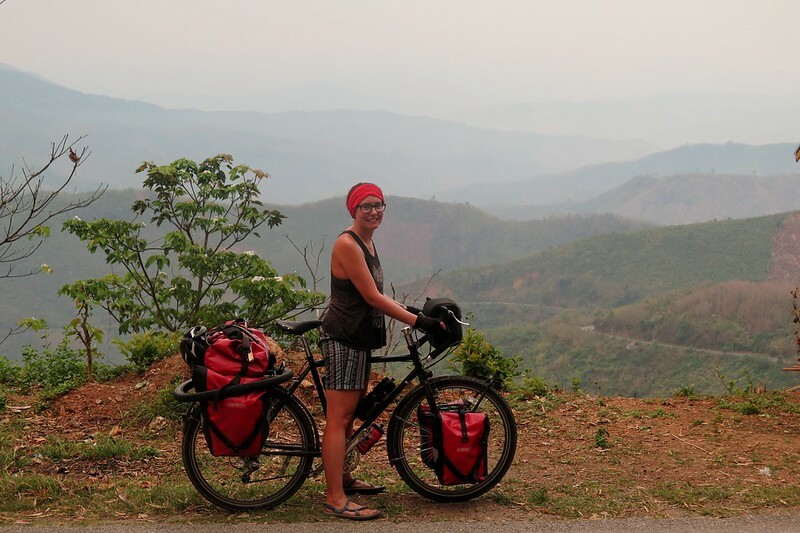 The next day started sunny, and was going to be a longer one, 77km down to Luang Prabang. 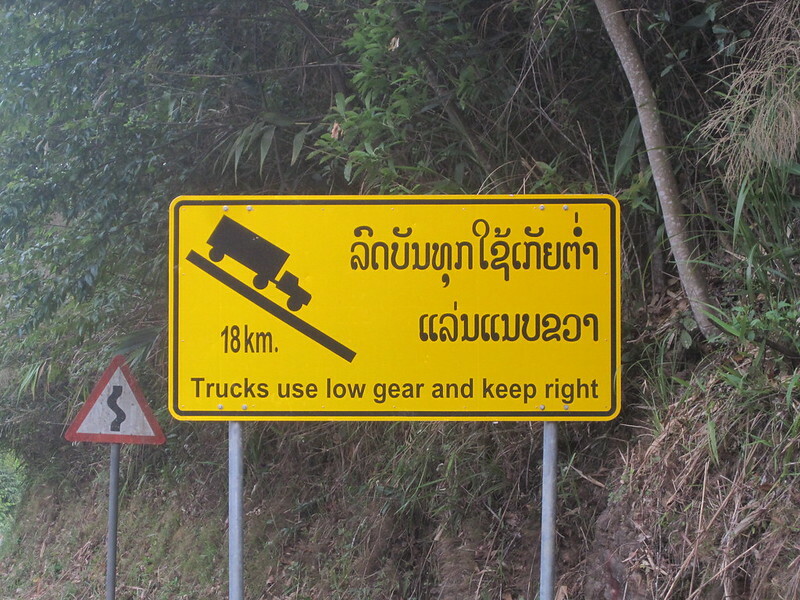 After a short initial climb, we saw a sign saying the next 18km would be downhill. Amazing! It was a long, windy and super fun start to the day, coasting back down into the next valley. In the end, the descent was more like 22km and about 40 minutes without pedalling. Of course, getting down to the valley floor and crossing a river, there was only one way to go from there, up. Despite the tired legs from the past few days, we pushed on and up the last big climb, looking forward to a few welcome rest days. 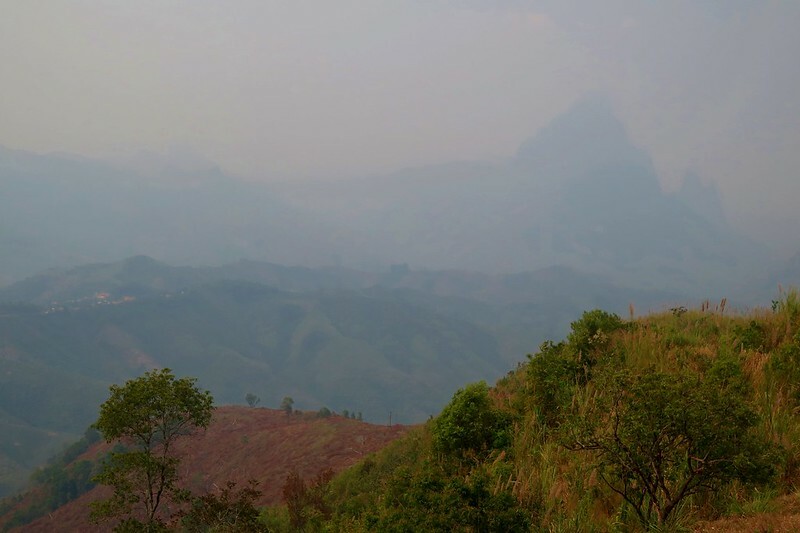 By mid morning we reached the top and had another long descent, taking us down to join the river which would lead us down into Luang Prabang. The last stretch was a lot quicker, cycling mostly along the flat next to the river. The sun was out and it was really warm as we were down at only 300 metres altitude. 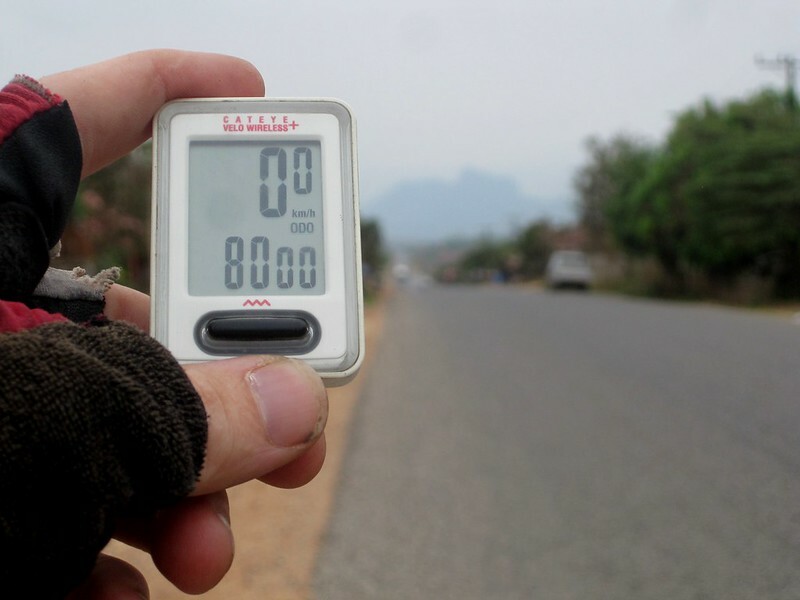 We counted down the distance markers into Luang Prabang, but just 10km out, we were faced with one last climb. A very steep and unexpected 20 minute zig zag over a hill just outside town. With gritted teeth and a few swear words we reached the top and rolled down the other side. It was easy once we got into town to find somewhere to stay, and even easier to find something to drink. We checked in and wandered down to see our old friend the Mekong River, where we sat having lunch and a cold beer. It’s been a hard few days in the mountains, but actually not as bad as we expected. The gradients were fairly gentle, so the climbs were long and steady, rarely getting too steep. Of course, the views have been incredible and totally made it worth it. I can see why this route is such a popular one. Yeah, we’re really loving it! Such beautiful mountains. Thanks for reading, Tim. Have subscribed to your blog, good luck with your adventures! Just catching up with you…..we cycled the same route back in 2010 and stayed at those same hot springs – remember it well, looks like it hasn’t changed. Enjoy LP!! We had a wonderful time there house-sitting last year – more good memories. Also the part of China you are headed for is very nice!! Yeah, Luang Prabang was really great, we stayed longer than we’d planned! Hope you’re both well and enjoying Vietnam. Don’t work too hard!